What is the Superdry Morgan? Some might argue that it is similar to an autorickshaw retrofitted with a S&S v-twin engine going backwards at break neck speeds. They would be wrong. Because the Superdry Morgan is so much more. It comes from a company that has been manufacturing classic British automobiles since 1910 with v-twin powered, two or four seater, three wheelers. It carries with it a rich heritage that stretches over 100 years. 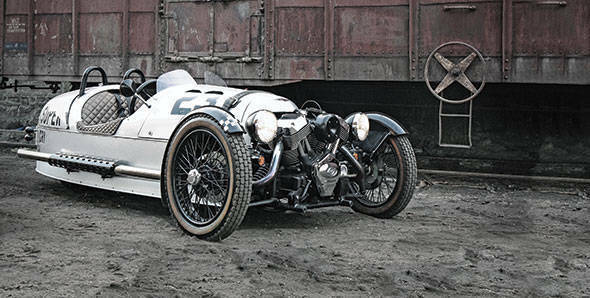 It has classics such as Morgan +4 and the more recent Aero 8 associated to its name. Hence, it is only fair to say that everyone who calls it a rickshaw going backwards deserves to be, as Rishaad would say, slapped across the face with a dead fish. If these unfortunate folk still call it an auto, then mere violence will not suffice. What might help is thumbing the starter button on the dashboard and grin like a mad man as you watch their doubts fade away in the throaty roar of the naked v-twin engine mounted in front of the car. It is this engine that forms the central piece of design in this car. I think the effect it has on people is something similar to the one a very pretty girl flashing them would. But the engine is not sitting there just for show. This 1990cc S&S v-twin makes 115PS. Stop laughing! You think that this is only as much as a Honda City iVTEC/Mitsubishi Cedia/ Renault Duster? That may be so, but unlike these cars the Superdry Morgan weighs a mere 500kg. This brings the power to weight ratio to near Noble M12 territory. Who's laughing now huh? All that power and the fact that it is all transferred to the tarmac by a single tyre at the rear means that it is very easy to break traction at the rear. Smash your right foot to the floor mid corner and you can easily have your tail chasing your front. Overdo it however and you'll end up facing the same direction you came from. But modulate your throttle right and it is quite easy to give those behind you a magnificent view of the upturned canoe-shaped tail going sideways. Before I digress too much - in case you were wondering why I keep calling this Morgan the Superdry Morgan, it is because this particular car is the result of a collaboration between Morgan 3 Wheeler Ltd and Superdry, the world famous clothing manufacturer. Only 200 of these special edition Morgans will be ever made. Superdry has even created a special edition leather jacket that matches the leather used in the car, just in case you were wondering. Why would you wonder about that? I don't know. Why would you? Anyway, Superdry had the Morgan brought down to India to mark their arrival as a brand on Indian shores.